Chameleon Coatings Cabinet Resurfacing franchise business opportunity. Free Chameleon Coatings Cabinet Resurfacing business franchise information. Chameleon Coatings is unique and offers you the ready made framework to build a successful business. You will enjoy advantages that will put you light years ahead of the normal sole proprietor business owner. You can avoid the costly trial and error and period that cause problems for so many business owners. Chameleon Coatings offers consumers the opportunity to completely revolutionize their kitchens with a variety of different finishes, but at a fraction of the cost of replacement. The home improvement market is growing at an incredible pace and kitchens are an integral part of improving the home. 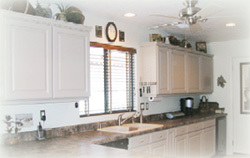 When customers think of doing something with their old, dark kitchen cabinets, the reality of remodeling sets in. The huge mess they face, weeks to completion and of course, the huge bill. With Chameleon Coatings all this is eliminated and a new kitchen is created at a fraction of the cost. Using the existing kitchen cabinets our resurfacing method provides a beautiful and durable finish that transforms kitchen cabinets, it also protects from water damage. Our finishes are stain resistant and are available in any color you can imagine. Cabinet resurfacing is a five to seven day process that combines frame resurfacing with the complete resurfacing of doors and drawer fronts. Cleaning, sanding, priming and up to 5 coats of a cutting edge material complete the job. Some clients prefer a complete door and drawer replacement and Chameleon Coatings offers this option. New hinges, knobs and bumper pads are available to the homeowner to complete the beautiful appearance of their new kitchen. The ability to operate a remodeling business without being impacted by weather conditions. Use of materials which are easy to use and transport. Business opportunities in the commercial as well as residential markets. Innovative industrial grade finishes from the latest technology, similar to that which homeowners enjoy on their kitchen appliances. Training includes all aspects of the business, sales, book-keeping and resurfacing. To learn more about the Chameleon Coatings Cabinet Resurfacing franchise opportunity, simply complete the form below.